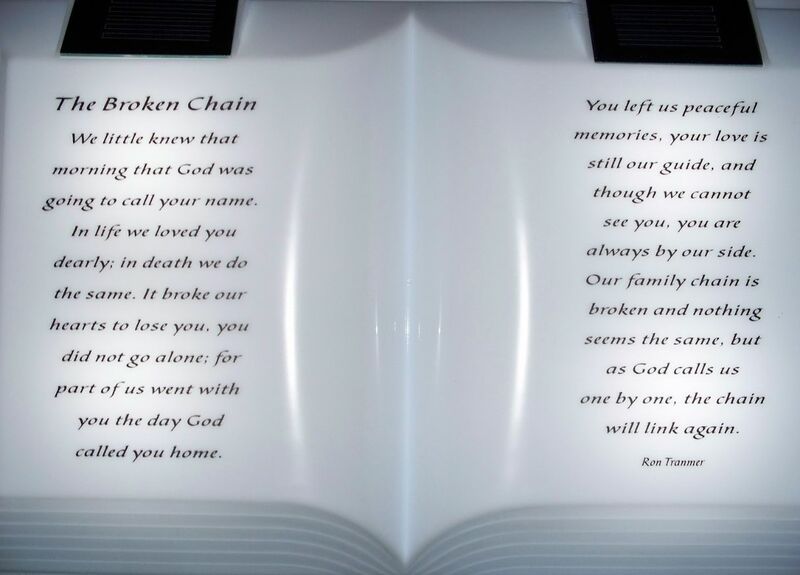 With its spectacular glow, the broken chain solar bible will illuminate a grave, memorial, floral arrangements or your home memorial garden. This solar bible will make a great gift for ourselves or others who have lost a loved one. This solar bible’s has great detail you can even see the pages edged on the bible. This solar bible comes complete with ground stake and batteries and is made to withstand most weather conditions. Floral arrangment not included. We little knew that day that God was going to call your name. In life we loved you dearly; in death we do the same. It broke our hearts to lose you, you did not go alone; for part of us went with you the day God called you home. You left us peaceful memories, your love is still our guide, and though we cannot see you, you are always by our side. Our family chain is broken and nothing seems the same, but as God calls us one by one, the chain will link again.